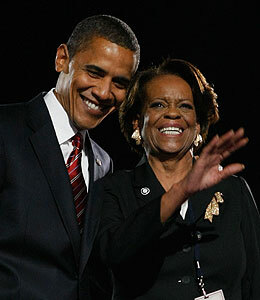 Barack's Mother-in-Law Headed to D.C.? President-elect Barack Obama is prepping his wife, Michelle and two daughters for their move to the White House, but is his mother-in-law moving into the White House too? That's true! The First Lady-elect has reportedly asked her mom, Marian Robinson, to help look after Malia, 10, and Sasha, 7, when the family moves to Washington. "I will do whatever Michelle needs simply because I know how important it is for her to see that the children ... still have discipline and still have things that children do at their disposal," Robinson told AP before the election.